National best-selling book writer accepts one of my paintings! My new painting, Incubation of Possibility, has just been accepted to be in Nancy Reyner’s new Acrylic how-to book, Acrylic Illuminations. Her books show techniques and examples in artist’s works. 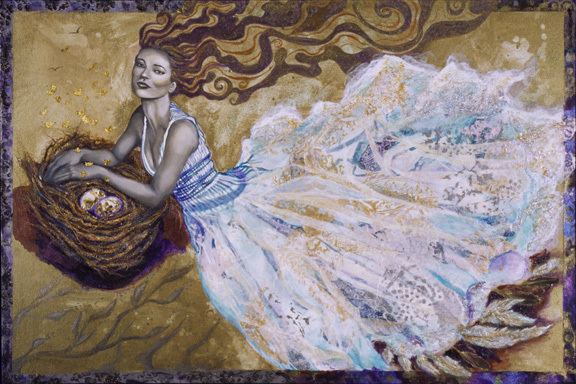 My painting, size 24 x 36″, used: gold leaf: bronze, silver and gold paint, both oil and acrylic paints, and the nest is dried corn silk from my garden! Her books are sold nationally through Artisans, Hobby Lobby, etc. I’ll post when it will be released. Very exciting!